At Jackson Child Care in Springfield, Virginia, Monica Jackson serves breakfast, lunch, and snack. Jackson Child Care was randomly selected as one of the winners in the Fall Action Plan Contest, and received a family-style dining toolkit.The family-style toolkit contains child size items that allow her to serve these meals family-style, which allows children to serve themselves with minimal assistance from teachers. 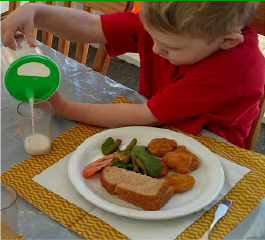 The child-size pitchers with splash free spouts are helping the children in her program master pouring milk and water easily and without spilling. When children serve themselves, they are also further developing their fine motor skills. Monica says this style of eating has allowed the children to become more confident in their abilities to serve themselves and helped them to practice manners and self-help skills. Family style dining is an integral part of the daily routine at Joint Base Langley-Eustis (JBLE) Child Development Program in Virginia. Children as young as one start to participate in family style dining in their individual classrooms.